Korg have redefined the workstation synth many times, and each time, it's become harder to see how they can better their previous achievements. The Triton Extreme is a bold new colour, but does the rest of it measure up? It has to be a coincidence: Korg's new Extreme flavour of Triton workstation must have been under development before Yamaha released their enhanced Motif ES (reviewed in January of this year). Yet here we are with what feels like Korg's answer to that challenge: it adds massive amounts of waveform ROM and USB connectivity to the high polyphony count and integrated sampling, sequencing and synthesis functions that the Triton family has come to represent. So close is the competition in this market that it seems that anyone entering it has to produce a silver- or chrome-liveried instrument: Motif ES certainly is, and even Roland's imminent Fantom X will adopt this colour scheme. But prepare for a shock. The latest Triton has a deep metallic-blue finish that reminds you of synths from the days before the release of Korg's Trinity — the original silver machine from 1995. Without dwelling on aesthetic issues, it's hard to see why Korg would go for this colour change and still keep the Triton name, but then I suppose the new case is not so expensive to produce, and of course the new Triton once again stands out from the crowd. Whatever the reasoning, and whilst I personally miss the sleek, now classic, silverness, you shouldn't judge a synth by its colour. The physical layout of the instrument is largely the same as what has gone before, and sonically and operationally Extreme is very much one of the Triton family. At least the most remarkable piece of front-panel real estate, present on Korg's flagships since the Trinity, remains largely unchanged. After using a touchscreen, so much other music-technology hardware feels less immediate, and it's still centre-stage here. In some ways, Triton Extreme is to Triton Studio what Triton LE was to the original Triton: it repackages the essence of the Studio at a significantly lower price point. However, while it loses a handful of Studio features, Extreme has been enhanced in a number of ways. 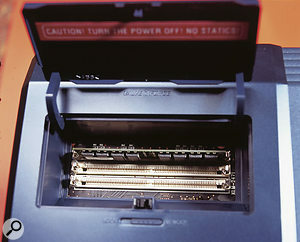 For example, gone is Studio's SCSI connector, but in its place are two USB sockets, joined by a Compact Flash/Microdrive memory card slot. More significantly, perhaps, Extreme has a lot more samples in ROM — 160MB to Studio's 48MB. In fact, the new instrument's overall value for money is enhanced since the extra waveforms are largely sourced from previously optional PCM cards: the piano, orchestral, Trance Attack and Vintage Archive cards are represented in their entirety, whilst Dance Extreme, Studio Essentials and Pianos/Classic Keyboards are present in 'best of' form. At £155 a card (£275 for the double orchestral set), that's a significant example of added value. In addition, Triton Extreme includes a load of new sampled material, much sourced from Korg's recent top-of-the-range 'arranger' keyboard, the PA1X Pro. Adding sample RAM (in the form of standard SIMMs) is easily done via the slots on the top panel (the slot cover is situated just under the valve blister).Photo: Mark EwingPhysically, the Extreme's layout is virtually identical to that of the Studio, with the touchscreen in the centre, and the various patch-selection, real-time control and sequencer/sampler operation buttons scattered around the area. Korg's Valve Force tube circuit (first seen on the latest Electribe phrase-composition devices) provides a surprise that's more subtle than the casing's colour change, but it's just as visually striking when it's switched on. It's housed behind a prominent plastic blister erupting from the front panel, and its blue LED backlighting ensures that you'll know it's in-circuit even if you can't hear the result. The valve itself hardly glows: it seems Korg have developed some electronics that extract all the device's valviness without driving it very hard. Good for device longevity, I'm sure, but no fun if you'd like to see the blighter working! And working it is: the blister gets warm. Though only one tube is specified (each Electribe featured a pair), it seems that a single valve can be coaxed into processing stereo audio. Valve Force is available for master or insert processing, and can be applied to audio entering the Extreme via its audio inputs. The remaining feature-set is largely that of the Triton Studio (see SOS July 2002, or www.soundonsound.com/sos/jul02/articles/korgtriton.asp). So you get 120-note polyphony (at most — and even this is only available under certain circumstances, depending on how waveform ROM is being addressed), dual programmable arpeggiators, a fully specified 16-track sequencer, a comprehensive sampler (offering handy integration with the sequencer) and so on. Extreme is also available in three versions, with 61- or 76-note synth-action keyboards, or an excellent 88-note piano-action affair. There are slight differences on the back panel, since there's no SCSI socket and no blanking panels for expansion options; the only extras that can be installed in the Extreme are a MOSS synth-modelling board and extra RAM for the sampler. Instead, what you do get around the back is six audio outs, two audio ins (with mic/line level switch and gain control), S/PDIF I/O on optical connectors, MIDI In, Out and Thru, and three foot-controller sockets. There is also a Compact Flash/Microdrive card slot, and two USB connectors. One of the latter allows the user to interface the synth with a computer, so that Extreme can talk MIDI with your favourite software. This process is automatic in Mac OS X, and drivers are supplied for Windows XP. 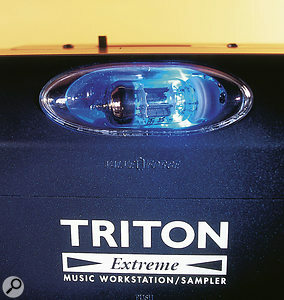 Other versions of Windows and Mac OS 9 don't appear to work with MIDI, but as long as the host computers have USB, they'll 'see' any optional Compact Flash card in the Triton Extreme's rear-panel slot and mount it on the desktop, allowing you to use the card to swap samples and MIDI files. The Extreme's other USB connector allows Extreme to play host to its own external devices — hard drives or CD burners, for example (see the box on page 182 for more on this). Waveform ROM: 160MB of 16-bit, 48kHz PCM samples, arranged as 962 multisamples and 1175 drum samples. Patches: 1536 Program memories, 1536 Combination memories, 144 drum kits, 256 GM2 Programs, nine GM2 drum kits. Sample-format compatibility: AIFF, WAV, Akai S1000/S3000 and Korg-format sample data. Sample RAM: 16MB, expandable to 96MB. Sequencer: 16 tracks, offering 1/192-note resolution. 200 songs, 20 cue lists, 200,000 notes maximum. USB: one Type A connector (for external USB devices), and one Type B (for computer interfacing). Summarising Triton Extreme's 'HI' (Hyper Integrated) synth architecture is straightforward; it's exactly that of previous Tritons, and has lots in common with Trinities and earlier Korg synths. 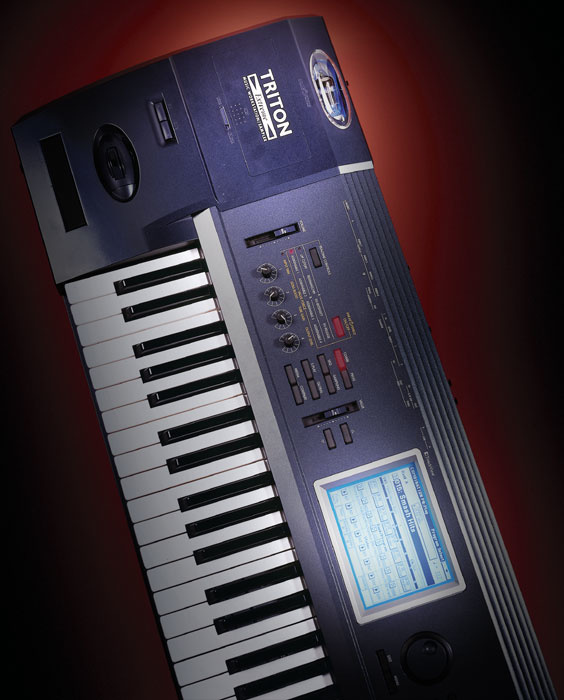 If you'd been cryogenically preserved just after buying and mastering a Korg M1 in 1988, and received a Triton Extreme as a thawing-out present in 2004, you'd still stand a good chance of being able to figure the new instrument out. Photo: Mark EwingAt the most basic level of the synthesis structure, there's 160MB of waveform ROM, organised as 962 multisamples and 1175 drum samples. Next up in the hierarchy is the Program, which can be assigned one or two multisamples that become that Program's 'oscillators'. The output from the oscillators then passes through a signal path akin to that in a analogue subtractive synth. Two-oscillator Programs use up double the polyphony of Programs with just one oscillator. The two oscillators can be velocity switched, and it's even possible to assign two velocity-switched multisamples to a single oscillator slot with no impact on polyphony (as they won't ever be playing simultaneously). Coarse and fine tuning options are also available, along with delay and reverse parameters for each oscillator. The signal path offers a pair of expressive and potentially aggressive multi-mode filters, plus filter, amplitude and pitch envelopes, two MIDI-sync'able LFOs for each oscillator, and a ton of modulation options, allowing you to add movement within a sound or to apply further sonic tweaks from the front-panel knobs or an external hardware control surface. In short, there appear to be no real changes to the synthesis system compared to that of previous Tritons. But since Korg have been getting it right, in many musicians's opinions, I'd guess they saw little need (beyond the addition of all that extra waveform material) for tweaking. The sonic open-endedness of the Triton is ensured by its sampling capabilities, which allow you to create your own multisamples from scratch, or import them from Akai-compatible CD ROMs (more on the built-in sampler later in this review). And though Extreme lacks most of the expandability of previous Tritons, an optional MOSS physical modelling board adds some of the functionality of a Z1 modelling synth to the Extreme. Drum Programs are different: rather than selecting drum samples from within a Program itself, you choose a whole kit of pre-mapped samples, to which a set of synth parameters is applied. There are 144 editable kit locations on board Extreme (plus nine preset GM 2 kits), 50 of which are factory-set. The kits can be edited via a sub-page of the synth's 'Global' mode. Here, one or two samples, with velocity switching, can be assigned to every key, and a very basic set of synth parameters — based around a filter and simple envelope generator — can be applied. A simple mixer lets you set up levels, pans and effect sends for each 'drum' in the kit. Both sorts of Program have access to insert and master effects, plus an arpeggiator. I'll return to the arpeggiator later, and there's more on the effects in the box on the left. Photo: Mark EwingNext up is the classic Korg Combination, first seen on the M1. In a Combi, up to eight Programs can be layered, with options to velocity and/or key-split individual elements. Each part may also be addressed on its own MIDI channel, like a miniature multitimbral setup complete with basic mixing options. Extreme's array of insert and master effects start to come into their own in this mode, with the user free to treat individual elements with dedicated effects. The arpeggiator also magically grows a twin: arpeggiators A and B can have their own pattern and note-resolution settings, making one-finger performances a definite option, since many of the presets are drum or riff-based patterns, a feature exploited in the factory Combis. Yamaha's Motif ES has just one arpeggiator, and it's just not the same once you've had two running at once! Note that the insert effects included in a Program are not automatically replicated in a Combi. You can manually recreate the appropriate settings, but it's easier to copy them, which you can do from anywhere on the Triton, including Programs, other Combis and Songs. The number of Programs and Combis that can be stored on the Triton Extreme appears to be the same as on the Studio; however, the new instrument comes with a lot more preloaded material. There are still 1536 each of Programs and Combis, but Korg fill up 1344 of the former and 1280 of the latter with factory settings; that's up from 512 each on the Studio. In addition, there's one bank of 128 Programs that becomes available with the MOSS board installed, and there's a non-overwriteable General MIDI 2 bank, complete with variation patches, to a total of 256. 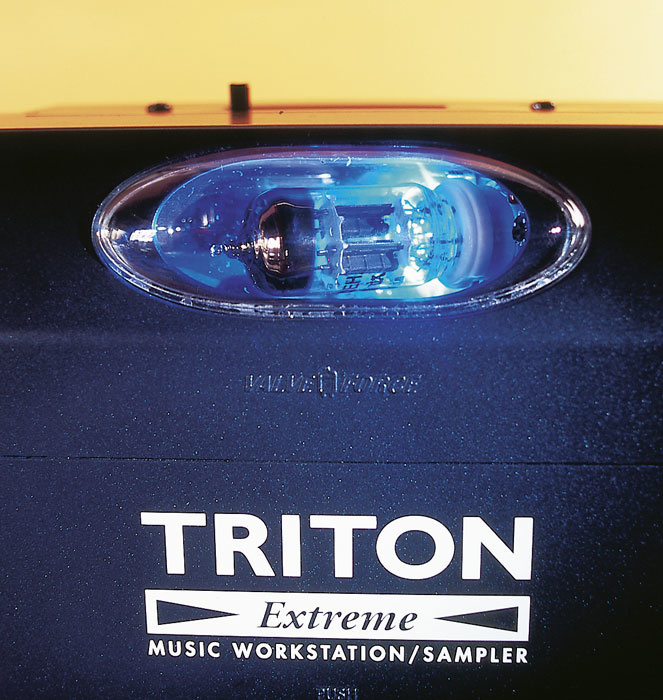 In general, the sound of Triton Extreme is rather like a fully-packed example of an earlier Triton — all the basic waveforms, Program and Combis will be the same. That said, it's nice to have them all in one place, without having to shell out for the extra PCM cards, or fuss with installing them. It's also good to have some of the excellent sounds and waveforms developed for the PA1X Pro arranger keyboard. Not that I have a soft spot for arranger keyboards, you understand, but this is a particularly well-voiced example. Demo a Triton Extreme, and you'll be impressed right from the start, whether you just scroll through Programs and Combis sequentially or take a more measured approach by auditioning presets within the 16 themed Categories (the Categories differ slightly for Programs and Combinations). The synth fires up with some piano-based Programs and Combis in the first slots. These have a really nice, upfront sound, and play especially well with the top-of-the-range 88-note weighted-action Extreme. Only the lower octave seems a little too artificial, as if there aren't enough multisamples to stretch right down to the bottom of the range. For once, I enjoyed some of the string simulations, though mainly the massed section examples (for example D018: '14 Violins ST', and D033: 'Largo Celli'); the solo and string quartets were not so good. The synth strings and string-like pads were effective, especially in layered examples, but it's hard to point you at any particular examples as stand-outs, since there are so many! As I mention towards the end of this article when discussing the arpeggiator, I found some of the one-finger Combis to be really impressive, quite contrary to my usual feelings in these matters! Most of the World-themed Combis had something to offer, though inevitably a little cheese becomes evident if you check out every one (particularly in a couple of Combis with the word 'Irish' in the name). If I have one overall comment it's that, in common with factory sound collections everywhere, there is a reliance on effects to create impressiveness. Nevertheless, the Triton's basic waveforms can sound excellent without the window dressing. As mentioned above, Combis can be used as mini-multitimbral setups, but for real multitimbral use, you need Sequencer mode. Here, you're presented with MIDI recording facilities that rival those of computer-based MIDI software. From the variety of potential time signatures, to individual track looping, and the comprehensive quantise and cut-and-paste editing, you may find yourself writing more with the workstation than your computer! Just remember to save your work somewhere, as all Songs are lost when you power-down. As on the recent tube-equipped Korg Electribes, the impressive glow actually comes from an LED (here, a blue one) rather than the built-in valve! Nevertheless, Valve Force widens your sonic palette nicely.Photo: Mark EwingBriefly, an Extreme Song is made up of a maximum of 16 tracks, each assigned its own Program and accessing a wide range of mix controls and track offsets such as transposition, but also including voice parameter offsets, thus allowing you to fine-tune a Program in situ without having to re-edit it and re-save it. Each track also has its own MIDI channel, and of course Extreme can be played multitimbrally from the sequencer of your choice. The mixing options include access to global and insert effects. You can record your data in step or real time, or a mixture of both. Post-record editing can happen on a global level (there are plenty of ways to move, correct and change data globally), or right down at the single-event level. The sequencer has quite a few nifty features when you start to investigate it more closely. For example, both arpeggiators can be used, and their output can be recorded into a sequencer track. And for those of you who might bemoan the way in which a Combi can't be used in a song, you'll be pleased to hear that the settings of any Combi (or Program, for that matter) can be copied into a sequence, via a feature called Auto Song Setup. This is a great option when you happen to be noodling with an inspirational sound, and would like to start sequencing with it right away. You won't lose that inspiration by having to set up a Sequence and replicate all the effect settings manually. You're a couple of button pushes and a metronome click away from starting to record your performance. The settings from another Song can also be copied, and if you'd like a regular starting point, you can use Templates. A good selection of factory-produced choices are provided, with memory locations for your own creations. Further automatic song creation assistance comes in the from of RPPR — Real-time Pattern Play/Record — which lets you trigger user-defineable or factory phrases with single key presses. Another aid to speedy song construction is the Cue List. With this facility, you can write verses, choruses and bridges and so on as individual 'Songs', organise how you'd like them to play back in a Cue List, and then convert the result, when you're happy, to a new Song. Couldn't be simpler. The 24-bit effects system remains much the same as that of Triton Studio (and previous Tritons). The major addition is the Valve Force circuit — a first for a workstation such as this — which functions as an insert or a master effect. Generally speaking, the effects system offers five insert effects 'slots' which can be assigned flexibly within Combis and Sequencer setups, plus two global send-type effects and a master three-band EQ. There is a central pool of 102 effect and processor types; any of these can be assigned to an insert effect, while 89 can be used as a master effect. The usual collection of reverbs and delays is included (all tempo-sync'able, of course), plus modulation, pitch-shifting, and amp-simulation algorithms. Ring modulation, doppler, and sundry straight and dynamic distortions add to what's on offer. Though insert effects can be chained, there are already-chained varieties that can be used in one slot. Then there are the special 'double-size' effects which use up two slots, such as the vocoder and the more complex delay options. The sends to the main master effects are accessed, in confusing fashion, from Menu 8, entitled 'Insert Effect'. This seems to be a bit of leftover OS from somewhere, and should really be cleaned up at some point. This is a good collection of processes, for the most part well-implemented, and capable of adding the final touches to your mix. What's more, in the same way that synth parameters can be controlled in real time, so can those of the effects, for moving beyond sweetening to purely creative uses. And then there's that Valve Force circuit, which is something of an interesting concept: using a real valve on the output of a digital instrument. Valve Force lends a warm, miked-up feel to anything you put through it, but note that the effect can't be used on the actual digital out of the Extreme. The Triton Extreme, like previous full-strength Tritons, offers all the facilities of a very well-specified stand-alone studio rack sampler, recording in 16-bit, 48kHz quality. That fixed rate is no problem, since resampling to lower rates is one of Extreme's many DSP tools (including normalisation and reverse). Custom multisamples of real instruments can be created, or imported from Akai-format sample CDs. The synth's own outputs can be resampled, of course, and beats and loops can be time-sliced and time-stretched. Sampling can be to RAM or to optional Compact Flash card. On the subject of RAM, I'm pleased to note that 16MB is provided to get you started, enough for nearly three minutes of mono sampling. The sample RAM complement can be upgraded to 96MB (via the access panel shown on page 177). By way of comparison, Yamaha's Motif ES comes with no RAM at all as standard, but it can be expanded to a more impressive maximum of 512MB. 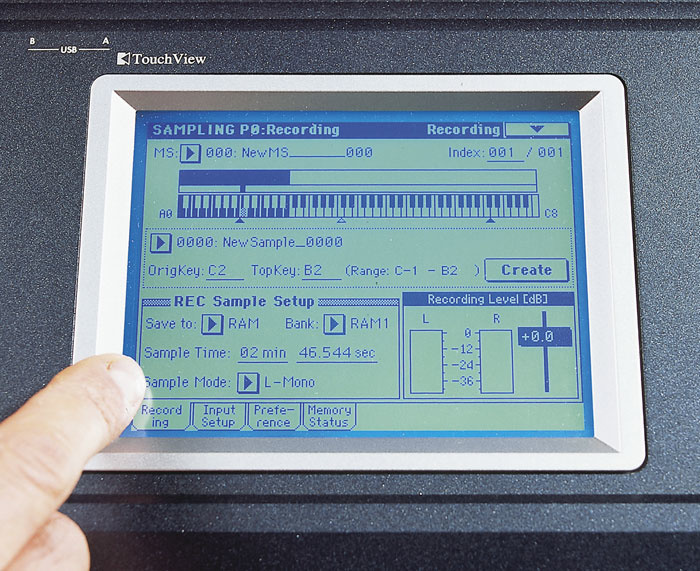 Sampling and keygrouping remains as easy as ever via the touchscreen.Photo: Mark EwingOne of the most interesting aspects of Triton sampling is the way in which the sequencer can be integrated, using what's called 'In Track Sampling'. This is almost like having a dedicated digital recorder on board — almost. You record audio into a track, and trigger data is created to play the audio along with the sequence on playback. With careful planning, it's even possible to add vocals to a sequence. There are limits to the length of audio that can be recorded, but that audio can be processed by insert effects on the way in, and fully edited afterwards. Keeping track of the resulting samples is a little tricky, but the saving/loading routines and file system are reasonably logical in their own way. And if you invest in a large hard drive (or one of the larger-capacity Compact Flash cards), you'll have no trouble keeping your work safe and backed up. You will have to buy something, though, as samples disappear on power-down. The rear panel's S/PDIF input can be used to record into the sampler, but it is fixed at a sampling rate of 48kHz, with no sample-rate conversion available, so you'll have to supply your own sample-rate converter if your digital devices can't be set to output at this rate. The USB computer connection comes in really handy for sample editing, provided, of course, that you've added a Compact Flash card to the Extreme. If so, you can then move samples seamlessly back and forth from synth to computer and vice versa, allowing you to record or edit with whichever device seems most appropriate to you. Korg call the Extreme's sampler an 'Integrated' device, and it really is: sampling can be entered from any mode, so you could sample yourself playing a riff on a Program or Combi, or just resample a particularly interesting sound effect or rhythmic effect produced by the arpeggiator. 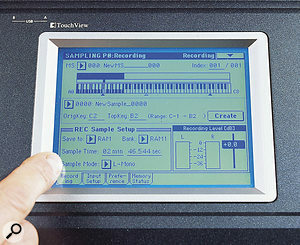 The output of the sequencer can also be resampled to RAM or Compact Flash card. Keep your mind open to the possibilities, and you'll be able to stretch the effects complement even further, by adding effects to the stuff you sample, freeing up the onboard processors for other work. As I've said elsewhere in this review, the Triton Extreme allows you to add USB-compatible storage devices to your setup. As there's no CD burner built in, you might well wonder whether you can hook up a USB CD burner to create reference CDs of Extreme mixes. The short answer is yes, although the process isn't exactly straightforward, and requires additional expense. Not only do you require a CD burner, but also a large card for the Compact Flash/Microdrive slot. Microdrives are available only in 1GB sizes, and Compact Flash cards come in a variety of sizes up to 1GB, so finding a card shouldn't be a problem. Thankfully, prices aren't too high, and they make a great backup medium for general piece of mind, not to mention for use at gigs. Assuming you are prepared to get a burner and a suitable card or Microdrive, the CD-burning process is fairly straightforward. You use the sampler's resample option to record a complete Extreme Song to the media installed in the card slot, and then go to the 'Make CD' page in Extreme's Media Mode. You have the option of creating a list that'll be burned all in one go, or you can add mixes to the CD piecemeal. The CD then needs to be finalised before it can be played on a normal CD player. I wasn't able to try this for myself, but certain guarded comments in the manual lead me to believe that the process may not be all that fast, with 1x (ie. real-time burning) the best that's on offer. Still, it's a nice option to have, and does mean your tracks can be started and finished wholly within your Extreme. Note that although Triton works at 48kHz, and has no sample-rate converter on its digital input, audio burned to CD is converted to 44.1kHz first. At first glance, not much seems to have happened around the back since the days of the Triton Studio. But look more closely and you realise the Studio's SCSI expansion slots are no more, nor can the mLAN board or the ADAT out/word-clock in option can be fitted to the Triton Extreme. 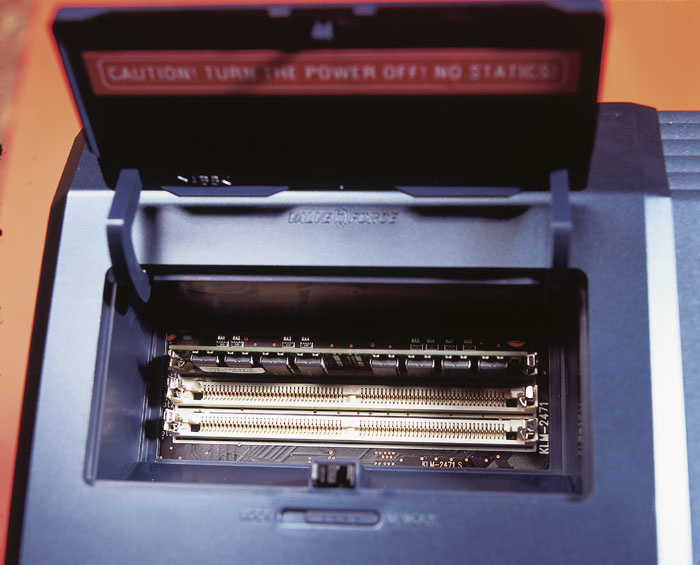 By way of compensation, there are dual USB sockets on the left of the Extreme's rear panel for the connection of peripherals, or for computer interfacing, and there's a Compact Flash/Microdrive slot on the right.Photo: Mark EwingThese days, arpeggiators go far beyond merely breaking up held chords, and most provide auto-accompaniment-like patterns, giving their host instruments an appeal that's as wide as possible. Korg do allow you to define your own patterns, of course, which at least means you can create automatic music that's based on your own ideas. If you create the right sort of pattern yourself, and mix note resolutions, you could even generate algorithmic-type musical output. The Triton Extreme's dual polyphonic arpeggiators are provided with five preset patterns and 507 user patterns, 489 of which are filled at the factory. Basic chord arpeggiations are available, over up to four octaves with a variety of note resolutions, but the phrases range widely from guitar strums and drum patterns to bass lines. It's a simple matter to set up key ranges for arpeggiations, and if you combine this flexibility with tempo-sync'ed delays and LFO modulations, the potential for instant customised grooviness is quite high. 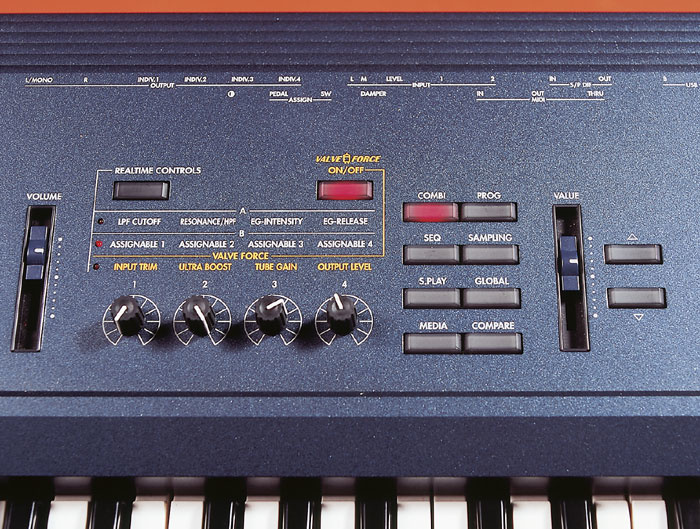 Try out some Combis for a good taster — for example, A001, 'Film Sound Track' doesn't even have its arpeggiators enabled as standard, yet the result is excellent when they are. Also check out Combi A007, 'EXP Film Strings', for an example with the arpeggiator explicitly engaged. Many of the Combinations in the 'World' category of factory settings are also pretty stunning. Be inspired, and come up with your own variations. The 88-note weighted version of the Triton Extreme, as used for much of this review.Photo: Mark Ewing As I mentioned in the main body of this article, it was my good fortune to have access to the 88-note weighted piano-action version of the Extreme for much of this review. Generally speaking, it's an excellent keyboard action, offering a good halfway house that provides something like the feel of a genuine acoustic piano without being too hard to play if you spend the rest of your time with plastic-action synths. As with all hammer-action keyboards, I felt a little odd at first (especially playing straight synth sounds and drum kits), but this soon passed. I wouldn't be too unhappy to have the Extreme 88 at the heart of my studio! 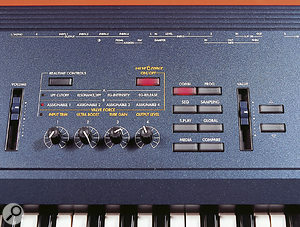 The action itself is Korg's RH2 (Real Weighted Hammer Action 2) keyboard. It's apparently designed to simulate a grand piano's touch, with light resistance as you play higher up the keyboard. It certainly feels like a player's keyboard, and would be just the thing to grace the stand of a monied lounge performer in search of feel, portability and a good piano sound-set, but who might need to occasionally branch out with backing tracks and a more varied sound. Extreme offers the best of everything Triton has become in the few years since its introduction. I can't say it leaps ahead of the rest of the range, but it still provides, on balance, more facilities for a lot less money than the previous Studio variety. The internal hard drive and optional internal CD-burner of the Studio might be missed by some, but adding your own external USB-equipped devices will hardly make a dent in the savings offered here. Sure, they won't be internal any more, but I'm not complaining. This leaves me wondering what's to become of the rest of the Triton range. Officially, Triton Studio is still a current product, but I don't know who'd buy a Studio model when Extreme is so much cheaper, and when you consider how much you get in Extreme compared to what you lose — just think of all that extra waveform ROM. I'd say Extreme sounds even more fabulous as a result. I know which option I'd go for! Some attrition in this range must surely be forthcoming soon, although it's hard to say what's on the way out. My guess would be that many potential Studio customers will be tempted by Extreme when the see the price difference — a 76-note Extreme costs less than the Studio 61! A lot of sound for the money. USB connectivity for computer interfacing and the addition of affordable external media. Digital I/O (optical S/PDIF) as standard. Some sample RAM provided as standard. Sample RAM only expandable to 96MB. Shame about the non-silver look, but I'll get over that with all those extra waveforms, and the warm feelings induced by the favourable price. See the 'Extreme Pricing' box, left.